A long-standing tradition, this year's reunion marked the 25th Biannual Saudi Aramco Annuitants Reunion and the 50th Anniversary of the reunions. 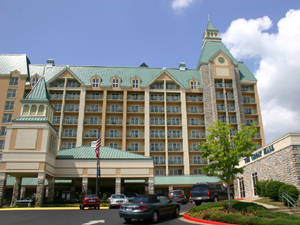 Reunion organizers, Tony and Judy Germani, who live in nearby Eureka Springs, Arkansas, hosted a first-class event at the Chateau on the Lake Resort and Spa nestled in America's heartland among the Ozark Mountains and overlooking the sparkling waters of scenic Table Rock Lake. 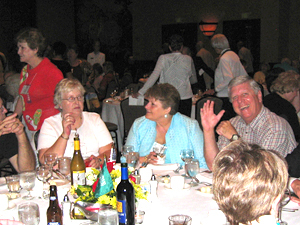 People came from nearly every state and from all over the world to attend the 2006 Annuitants Reunion held May 29th through June 1st in Branson, Missouri. 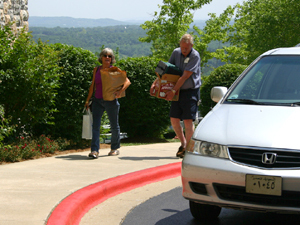 To beat the Memorial Day holiday rush many people arrived one to two days before the beginning of official reunion activities. Passing the time was made easy by beautiful weather and a luxury resort hotel. On Sunday, the hotel started to stir as participants in the Sideline Exhibits began setting up their presentations in two of the hotel's large conference rooms. 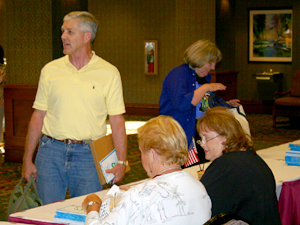 Reunion Registration and Information tables also opened for business on Sunday afternoon. At registration each person received a bag with event information, dinner tickets, and several gifts including a frame that is intended to be used to hold the free group picture of each table at the formal dinner scheduled for Wednesday night. Monday was devoted to mingling with many old friends and looking through the different Sideline Exhibits. The Community Heritage Gallery traveling exhibit caught the interest of many expats. Saudi Aramco presented a wonderfully done movie featuring the four main Aramco camps. The Sideline Exhibits, including our own Aramco ExPats exhibit, were very popular stops. A very nice quilt display decorated the Hospitality Room. Festivities began with a happy hour held from 5:30 to 7:00 p.m. filling the reception room with chatter and laughter. A business-casual Welcome Dinner was scheduled for 7:00 p.m. at which time a center panel in the back wall slid open to reveal a very large, and handsomely decorated dining hall. Guests enjoyed steak and salmon with live musical accompaniment by the Jody Simrell Trio playing cover favorites such as Fats Domino and Elvis. At the head of the large dining hall, the stage was set for the welcome presentation. Following introductions, guest speaker, Nail Al-Jabeir of the Information Office of the Royal Embassy of Saudi Arabia in Washington, D.C., gave a powerful and heartfelt speech. He began by thanking Annuitants for their contributions to the country of Saudi Arabia. He emphasized the importance of building person to person relationships and not government to government. He noted that he had read many books on Saudi Arabia written by people who had never travel to or lived in Saudi Arabia yet claimed to be experts. 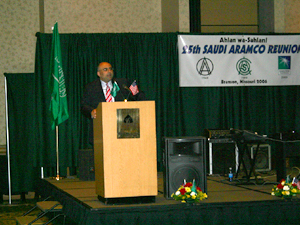 In contrast, he thanked Annuitants for being the best of ambassadors for Saudi Arabia. In addition, he thanked Annuitants for being a very special group of people who left their homes to come to Saudi Arabia and essentially train Saudis to take over their jobs, leaving behind a legacy of one of the most successful companies in the world. Mr. Al-Jabeir also pointed out that the number of Saudi students studying in the United States has declined dramatically in the last few years. He thought it was dangerous to have the student exchange declining and noted that Saudi Arabia is one of the only Mid-East countries having never been colonized by a western government. The significance in this being that western influence in Saudi Arabia has been selected by Saudis because they wanted it and not because it was forced on them. The United States and Saudi governments have been working together to address the issue. So far, 10,000 scholarships have been awarded to Saudis with the majority focusing on studying in the United States. The Saudi government looks at this progress optimistically. Mr. Al-Jabeir was well received by the guests at the reunion. 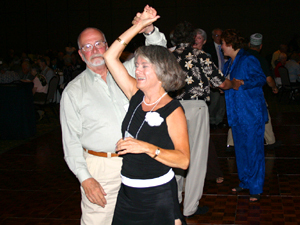 Following the welcome presentation and a delicious dinner, reunion guests took to the dance floor.